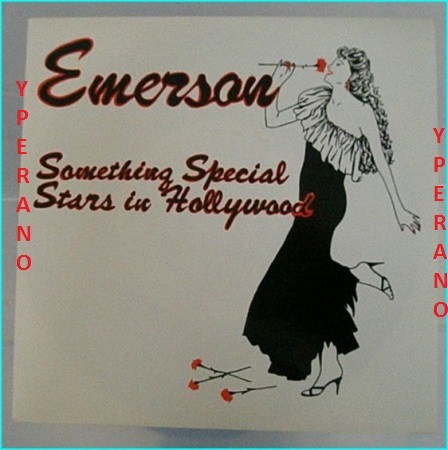 Home / Search by Media Type / 7" / EMERSON: Something special + Stars in Hollywood 7″ Mint condition. Melodic N.W.O.B.H.M. excellent vocalist. HIGHLY RECOMMENDED. Stuart Emerson is a background vocalist and musician playing drums, bass, keyboards, and guitars. He has worked on albums for artists including Meat Loaf and Bonnie Tyler. His first recordings were with NWOBHM band Emerson which included Simon Blewitt (aka Sam Blue), Stuart Emerson, Brian Emerson, Dru Irving, Jon Sellers. 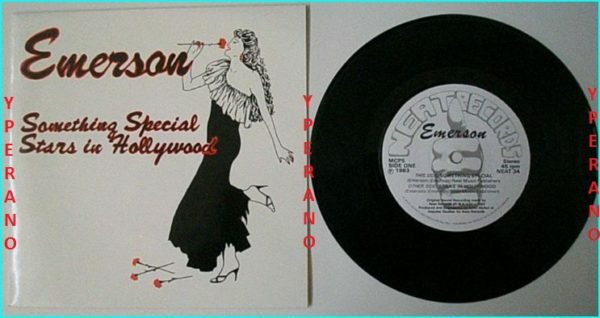 They released their debut single “Something Special” in 1983 on Neat Records. Other members of the band who did not appear on the single include Charles McKenzie, Rich Manley-Reeve and Mick White (later of Samson). Emerson met singer Lorraine Crosby in Newcastle upon Tyne when he was looking for a backing singer for his band. They began writing together, and also became a couple. In the early 1990s, Crosby sent songwriter and producer Jim Steinman some demos of songs she had written with Emerson. Steinman asked to meet them, and the couple decided that they would move to New York to give their careers a boost. They then followed Steinman after he moved to Los Angeles, living in the Magic Hotel, where all of Meat Loafs band were staying, until they could find somewhere permanent to live. Crosby performed on song “I’d Do Anything for Love (But I Won’t Do That)”, but as she recorded the track as guide vocals, she did not receive any royalties. The couple eventually returned to England. 1993 Meat Loaf album Bat out of Hell II: Back Into Hell. 1995 Bonnie Tyler album Free Spirit. 2004 Bonnie Tyler album Simply Believe. 2004 Reim and Bonnie Tyler single Vergiss Es. 2005 Bonnie Tyler album Wings. 2008 Hit Collection Edition Bonnie Tyler. SKU: YP-2469 Categories: All Genres, Hard Rock, NWOBHM, Search by Media Type, 7", NWOBHM 7"